This is a very common problem among bloggers either using blogspot or wordpress platform that their blog can’t be properly access without www in the front of the url.WWW is called the top level domain which is usually configured in the CNAME records after buying the custom domain. 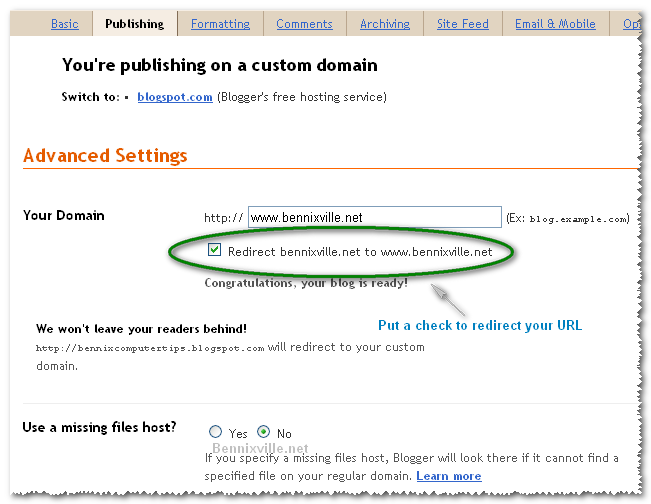 In the case of blogspot users, when buying and using a custom domain in Blogger/Blogspot it won’t allow adding a domain without the top-level . Example, www.yourdomain.com is the acceptable one but yourdomain.com will be usually rejected. So, the solution is URL redirection. The steps are fairly easy that won’t take a minute to configure and work. 5. Don’t forget to type the CAPTCHA and hit SAVE before leaving. 6. To test, type your domain without WWW in an open browser. Congrats! You’re done.